Anguilla - Where Feeling is Believing! Anguilla is the most northerly of the Caribbean leeward islands, sustaining a breezy charm that meanders its way into several aspects of its cultural identity and personality. For the green-conscious traveller, Anguilla aims to obtain 15% of its energy from solar power. Anguilla is also known for it’s boat racing, which is their national sport. The island is casual and easy, with a unique blend of high style and low-key elegance. It is the best of the good life set to a slow and casual island tempo. 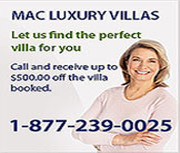 And MAC Caribbean Villas (MAC) can help find your ideal villa. With over 50 villas on the island to chose from, MAC can help connect you with the villa that fits your personality, lifestyle, group size, and budget. These beautifully appointed villas all come with private pools, personal space, and a little piece of Heaven. Getting married? Need a corporate retreat? There are villas for that too! Look no further than MAC for your Caribbean vacation rentals.